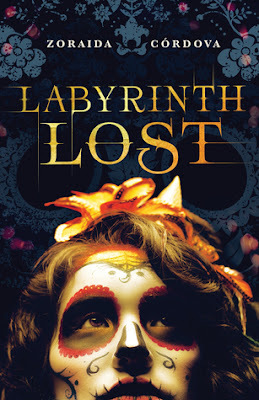 "Labyrinth Lost is a magical story of love, family, and finding yourself. Enchanting from start to finish." -Amy Tintera, author of Ruined. This was a great read! I am not familiar with Zoraida Córdova's writing, or her books, but I am a huge fan of witches and magic, and that is the main reason why I picked this one up. This story is non-stop from beginning to end, and filled with TONS of magic! Super entertaining! There wasn't one moment where I felt the story dragged, or stopped and wasn't moving along. Each chapter was a set-up for the next. Everything about Labyrinth Lost was so easy to picture in my head. Zoraida did an amazing job putting into words each world/section that Alex & Nova enter while in Los Lagos. It had a nice little twist towards the end that completely blew my mind. I SO did not see that coming! I also really liked the Spanish background Zoraida added to the story. I am hispanic and grew up with a mother who was a bruja. Let me tell you, some of the things in this book brought back a lot of memories. LOL! Anyway, this story is a MUST-READ!